The man I called five days ago “the ethnic cleanser of Banias” is emerging as the suspected mastermind of Saturday’s twin bombings in the Turkish town of Reyhanli, a main hub for Syrian refugees and opposition activity in Turkey's Hatay province, just across the border with Syria. Turkish authorities are holding nine Turkish citizens believed to have links to Syrian intelligence in connection with the two car bombs in Reyhanli that left 46 people dead and 100 injured. He was talking about a Syrian army operation supported by “المقاومة السورية” -- the “Syrian Resistance” -- against the Sunni population of the historical coastal town of Banias, killing hundreds of civilians, including children. 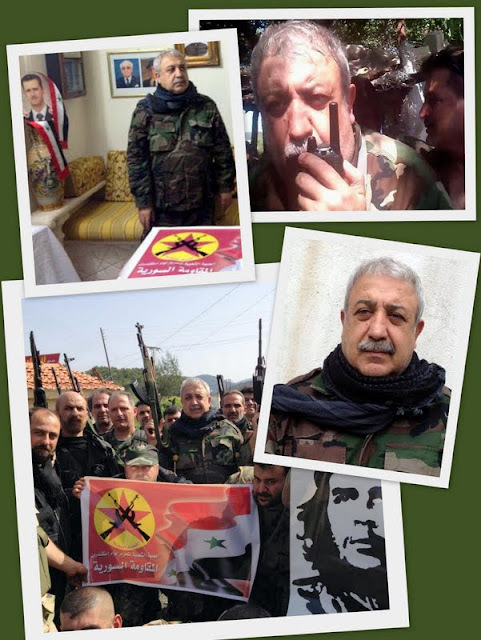 The point is there was somebody, technically still a Turkish citizen, Mihraç Ural, who was shown as the responsible party… There are videos of him available on YouTube as he speaks in Arabic and tries to incite militiamen around him to cleanse Banias of Sunnis as soon as possible. The name is not alien to Turkish security circles. Ural was among the founders of an armed leftist group dubbed “Acilciler” – the “hasty ones” – in the late 1970s and is responsible of a number of political murders, bank robberies and similar acts of terror. In Syria, where he commands “المقاومة السورية” (the “Syrian Resistance”) militia, a shabiha subdivision, Mihraç Ural goes by his Arabic nom de guerre: Ali at-Kayyali. In his leader comment this morning, Ghassan Charbel, editor-in-chief of pan-Arab daily al-Hayat, also alludes to the Reyhanli-Banias connection. It is not child’s play for Ankara officials to say perpetrators of the deadly bombings in Reyhanli are Turkish citizens associated with Syrian intelligence. It is not child’s play either to say some of the suspects were involved in the latest Banias massacre. True, the fallout between the two countries is not new. Equally true, the wrangle has now acquired grave dimensions. When a government accuses a neighboring state of being behind bombings on its territory, it commits itself to a response. The response could have been a classical recourse to the UN Security Council, but Ankara is aware that Council’s door is firmly locked and strictly guarded by Russia. Ankara is thus expected to seek a response surpassing a salvo of cross-border shells or a reminder underscoring its NATO credentials. Recent months were replete with signs of the mushrooming estrangement between Ankara and Damascus. Recep Tayyip Erdogan has not tired of asking Assad to step down. He has used tough words to describe his former friend. Ankara did not suffice with hosting hundreds of thousands of Syrian refugees. It went further and assumed the mantle of the safe haven and stronghold of Assad’s enemies, including the Free Syrian Army. Assad did not grin and bear his former friend either. He hosted Turkish opposition leaders and held Erdogan fully responsible for the rot. He addressed the Turkish public via the Turkish media to increase the pressure on Erdogan, denying him the chance to do the same. Syria’s state-run media unearthed old wordbooks to warn of the Ottomans getting astride Muslim Brotherhood horses to ride back and revive the caliphate. Syrian state media also revitalized the Iskenderun (Alexandretta) file, which has been dormant for decades. The Reyhanli bombings’ timing elicited much scrutiny and a series of scripts. The outrage came a few days after the U.S.-Russian agreement to hold an international conference for a political solution in Syria based on the June 2012 Geneva Declaration. It also came after fighters of the Kurdistan Workers’ Party (PKK) started withdrawing from Turkey in keeping with the Erdogan-Ocalan agreement. Incidentally, Erdogan’s deal with Abdullah Ocalan was a game-changer for Syria’s Kurds, turning them from a card up Damascus’ sleeve into an ace of trumps in Ankara’s hand. The Reyhanli bombings also came in the week of Erdogan’s talks with President Barack Obama at the White House next Thursday. The Turkish-Syrian honeymoon was drawn out. Turkey hoped an “exemplary rapport” with Syria was its gateway to the Arab world and key to building bridges to the region. Syria too was elated to reach out to a Sunni member of NATO. Damascus felt relations with Turkey compensated for its tiff with Saudi Arabia and Egypt and imagined Ankara becoming both its passageway and password. Syria accuses Turkey of spewing out arms and rebels. Ankara accuses Damascus of trying to destabilize Turkey and undermine the unity of its social fabric. Ankara yearns for Syria without Assad while Assad dreams of Turkey without Erdogan. The Syrian information minister did not omit calling on Erdogan lately to step down. But the game is more intricate. Russia insists it is the door and latchkey to a solution. Iran does not lack the appetite to assume such a role despite its deep involvement. Solving the Syria crisis is so difficult. The door is stuck shut and the small key is lost. Erdogan will surely ask Obama to open the door and find the key, arguing that the once widespread treatment of wounds by cauterization is long overdue.